yields were distinctly lower than in years past. Extensive manual selection, world-class vineyards and well-timed interventions paid major dividends this year, leading to frequent comparisons to the legendary 1959 and 1971 vintages. "The 2015 grape harvest was unusual in two ways. Not that the trend is completely unexpected, but never before have we had a harvest kick off so early and be so brief. It's definitely a change from the classic romantic vision of a wine harvest. But the bottom line is this: all's well that ends well," says Steffen Christmann, President of the Verband Deutscher Prädikatsweingüter (VDP). A dry spring and a warm, dry growing season set the tone for a dry summer and record heat. In many places the lack of precipitation during the first six months did little to disturb the vines. The plants acclimated themselves quickly to the warm temperatures and pulled on reserves from the copious rain of the previous winter. The dry conditions nevertheless posed a number of other challenges for the VDP winegrowers. Younger vines in particular required a variety of extra measures, including mulching, moderate defoliation and crop thinning to preserve what little water the soil contained and minimize the risk to the harvest. Early September brought real rainfall, easing drought-related concerns significantly. While the vines had become accustomed to less precipitation, they happily accepted the extra water when it arrived. On the other hand, now the winegrowers had to contend with the threat of bursting berries. As the harvest date approached in mid-September, a fortuitous high pressure system settled in with picture-perfect dry and pleasant weather — and a collective sigh of relief. Cool nights and continued warm days encouraged the grapes to develop their full varietal spectrum of characteristic aromas. The conditions were thus perfect for harvesting flawless, fully ripe fruit. The late-ripening Pinot varieties in particular, as well as Riesling and Silvaner, handled the year's severe dryness masterfully. The only downside was the lower yields reported in many regions. Baden for example registered a 10% drop over the year prior. Yet the exquisite quality of the harvest more than made up for those losses. By Eric H. Litchfield, President of GermanWineEstates.com Inc.
Thanksgiving is certainly one of the most significant family holidays of the year. This fall celebration represents a time of family gathering, giving thanks to the year’s bountiful harvest. It’s a joyous holiday, with an abundance of delicious food and wine for all to share at the table. It goes without saying that turkey is one of the all-time favorite dishes for Thanksgiving dinner. But let’s not forget the accompaniments such as sweet potatoes, cranberry sauce and apple pie, just to name a few. Flavors range from salty to spicy and savory to fruity. It’s a smorgasbord of tasty delights. But what about the wine? Is there anything that can handle such an array of gustatory sensations? You bet – RIESLING! Riesling is a chameleon of a grape. The varietal’s natural ability to adapt flavor components from the soils in which it grows adds to the complexity of its flavor profile. For example, grapes grown on slate soil found in the Mosel wine region of Germany provide stony, minerally flavors with high levels of brisk acidity. Those which grow on primary rock soils of Austria’s Wachau district are deeper and richer with more succulent flavors. The natural fruitiness in the grape remains, but in the Mosel, the wine’s fruit notes are apple, lemon and lime whereas those from the Wachau display hints of peach, tangerine and apricot. Riesling is also a natural. Natural as Mother Nature intended. No fooling around during the vinification process with enrichments to the juice such as barrel fermentation and oak aging, to enhance flavors with often-times overpowering toasty richness. There’s also no malolactic fermentation which turns brisk malic acidity into a creamy, buttery essence which softens and rounds out the wine’s natural acidity. Not Riesling. The vinification process is simple. Crush the grapes, ferment the juice and voila, great wine! These attributes make Riesling the perfect wine for Thanksgiving. From bone-dry to syrupy sweet, Riesling runs the gamut. Depending on your sense of taste, there is a Riesling for you, and anyone for that matter. The natural flavors of the wine marry themselves perfectly with a multitude of different dishes being served at the table. Let’s give thanks to nature’s most perfect white wine grape and enjoy a nice bottle of Riesling for Thanksgiving. Get the lowdown on the versatile wine world darling. It’s about that time to swap your go-to summer rosé with your favorite Riesling, as July’s month-long “31 Days of German Riesling” is upon us. This year’s celebration is a step up from the “Summer of Riesling” which restaurateur and sommelier Paul Grieco launched seven years ago to honor one of the great Vitis vinifera grapes. More than 100 restaurants and wine shops across the country will participate, offering selected German Rieslings by the glass. It’s a deliciously diverse grape, so there’s a style for everyone’s palate. Here’s the lowdown on this cool, crisp wine. 1. First of all, it’s pronounced REE-sling. 2. It’s a diverse variety. It grows in each of Germany’s 13 growing regions. It can thrive in different climatic conditions, from cold and cool to warm. Riesling ripens on many soils, including slate, mica schist, granite, fossil limestone, quartzite, rhyolite and sandstone. 3. Germany’s Mosel region, famous for its crisp, citrus-centric Riesling, dedicates a whopping 60% of plantings to the variety. 4. Riesling’s hallmark is its acidity. It’s what provides the structure and longevity that allows them to age so well. 5. It has major range. Rieslings can be dry, off dry, semisweet or lusciously sweet (those made from botrytised or frozen grapes). 6. Speaking of dry—some drinkers assume all Rieslings are sweet, but there are many bone dry options, too. These are especially interesting because they are perfectly balanced by high acid, which gives them great body. 7. If you love dry Riesling, look for the word trocken on the label. This means “dry,” and the wines have alcohol levels of 11% and above. If you’re more into off-dry styles, look for the word feinherb on the label. This has some residual sugar and a dry finish. And if you love medium-sweet styles? Go for halbtrocken or lieblich, which have alcohol levels between 9–10.5%. 8. Anything below 9% alcohol by volume tends to be is sweet. But remember, there’s still acid in these babies to keep the balance. 9. Make sure to stop and smell the Riesling—its aroma spectrum is mind-blowing. The lightest Rieslings smell like a summer-night stroll through a jasmine and orange grove. Others are explosions of lemon and lime, pink and yellow grapefruit, orange and tangerine. Riper styles prompt visions of juicy peaches, yellow plums or apricots, with swirling clouds of mango and pineapple. 10. Riesling gets better with age. So when ordering your next pour, choose a mature vintage. You’ll sniff honey, honeysuckle, candied peel and super-charged peach. The palate will feel like balm. Think I’m kidding? Order a 20-year-old. Last year, the German vineyard area planted with Pinot Gris (Grauburgunder) grew by 5.3 percent – the largest increase recorded among all grape varieties. In all, the area devoted to this grape has reached 13,904 acres, or twice the size it was in 2000. According to the German Wine Institute, based on statistics released by the Federal Statistical Office (Destatis), Germany now ranks second only to Italy in terms of Pinot Gris plantings. Another member of the Pinot family, Pinot Blanc (Weissburgunder), is also on the rise in Germany, up 3.3 percent from the year before. There are currently 11,846 acres under vine, or some 85 percent more than in 2000, which makes Germany the world’s leading source of this fashionable grape variety. Riesling remains the country’s premier and most popular grape variety (57,920 acres), and accounts for about one fourth of Germany’s vineyard area. Statistics show a slight increase (0.6 percent) in plantings in 2014. About half of the world’s Riesling vines are planted in Germany’s wine-growing regions – more than anywhere else in the world. 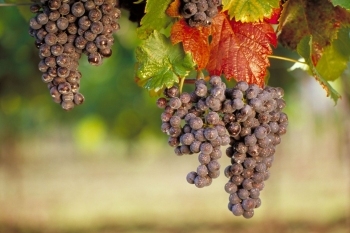 Riesling’s red counterpart is yet another Pinot: Pinot Noir (Spätburgunder). With 29,116 acres, it is Germany’s most important red wine grape variety and accounts for about a third of the country’s red wine grape area. 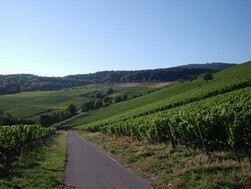 Worldwide, Germany ranks third in acreage devoted to Pinot Noir vines. A brief look at statistics on new plantings in Germany in 2014 confirms the trend: Riesling and Pinots score high marks with German wine-growers. Of the nearly 6,000 acres of newly or replanted vineyards, 1,438 acres were Riesling, 835 acres Pinot Gris, 504 acres Pinot Noir and 450 acres Pinot Blanc. Among the specialty varieties grown in Germany, Sauvignon Blanc continued to post relatively dynamic growth in 2014. In the meantime, some 3,000 acres are cultivated; roughly six percent more than the year before. Growth among internationally popular red wine varieties, such as Merlot or Cabernet Sauvignon, was – at best – moderate: 35 acres and 15 acres, respectively. Merlot plantings now stand at 1,480 acres and Cabernet Sauvignon, at 730 acres. Very few of the remaining 100 or so different grape varieties cultivated in Germany play a significant role in the German wine business. The ten most important varieties set the tone and account for some 80 percent of Germany’s total vineyard area. As of March 2015, the total German area under vine is 253,127 acres in size. It has remained relatively constant in the past 20 years. The ratio of white to red varieties has changed only slightly and today stands at 64.9% to 35.1%, respectively, whereby white wine varieties registered a small gain in 2014, as reflected in current consumer trends in Germany. Following the market trend toward dry wines, a full 44 percent of all "Qualität" and "Prädikat" wines bottled in Germany last year were classified as "Trocken" (dry). In estimates by the German Wine Institute (DWI), this represents an eight percent increase since a decade ago (2004). Over that same time period, the market share occupied by off-dry wines saw only a one percent increase, from 21 to 22 percent. These assessments are based on figures from the official wine classification agencies, which in 2014 tested 131,000 different wines (7.4 million hectoliters) across Germany. The statistics show that 59 percent were white, 30 percent red and 11 percent rosé. Roughly 90 percent of all wines produced annually are submitted for quality testing each year, with the remaining ten percent either marketed as land wines or used to produce sparkling wine. Compared with the five-year average, last year saw four percent fewer "Qualität" and "Prädikat" wines brought to market, which can be attributed to the below-average harvest yields in 2013. The DWI emphasizes that all "Qualität" and "Prädikat" wines produced in Germany are subject to a sensory, analytical and labeling inspection before receiving approval for market release. An official inspection number may only be applied to the label once the necessary preconditions have been met. The last two digits of the "AP-Nr." indicate the year in which the wine was tested. This means, for example, that a 2011 red wine left to mature in the cask for an extended period may actually have a '14' at the end of the inspection number. The winter of 2013/2014 was extremely mild. Little frost we had in the wine regions, it was not a severe cold and the few cold spells did not last long enough to freeze the soil nor kill pests.The warm winter gave way to an early and warm spring throughout Southwest Germany. Budbreak was very early, so was flowering and growth of the berries to pea size. From March through June, temperatures were higher and the precipitation was lower than the 10-year median. Flowering occurred under perfect, very warm if not too hot day and warm night temperatures and the onset of fruit was excellent, indicating the potential for a full crop. By the end of June the sum of accumulated heat degrees indicated we might have a record warm year, even on the 100 year scale. At the same time the vineyards in almost all of Germany were dealing with drought stress. The long awaited rain came in July, the temperatures remained very warm. August turned to be a cool and wet month. The first half of September, too, stayed cool and wet. The temperatures warmed up in the second half of the month, humidity levels remained high. The grapes caught up nicely from both drought stress in June and cold weather in August and, at the end of September, were thin-skinned and building up good sugar levels. While this was good news, there was bad news by means of a new pest and the lingering, high humidity in combination with very warm weather. The total German harvest is estimated at 9.242,000 hectoliters (1 hl equals 100 liters). 2013 yielded 8.432,000 hectoliters and the average of 2004-2013 lies at 9,165.000 hectoliters. The two largest regions, Pfalz (2.225,000 hl) and Rheinhessen (2.550,00 hl) had large, stable crops in ’14, almost identical with 2013 and with the 10 year median. The Mosel came to 895,000.00 hl, up significantly over ’13 and 8% above the 10 year median. This was due to a large crop of the ancient “Elbling” grapes in the southern part of the Mosel with abundant yields while the traditional, steep Riesling vineyards of the middle and the lower Mosel produced significantly lower yields and an overall much smaller crop. While farming practices and foliage work made a difference everywhere, the local and regional microclimate weighed in more pronouncedly in 2014 because of significantly different intensity and quantity of rainfall (even hail, see before) in the 2nd half of September and in October. Harvest started under fine conditions with a warm, dry period from 20th September until the 6th of October. Much of the crop of the premium varietals (Pinot family, Riesling) in the South was brought in during that time. The majority of the northern regions (Nahe, Mosel, Rheingau, Mittelrhein and Ahr) started harvesting those varietals in the 1st week of October. From 6th October, warm day and night temperatures and frequent rain showers produced thin-skinned berries and a perfect environment for fruit flies. This was accelerated by the rapid spreading of spores from botrytis cinerea and other fungi. In a race against the clock, every available hand and (in flat or sloping vineyards) every available mechanical harvester, were mobilized to bring in the crop, leading to what has been dubbed a „turbo harvest“ in Germany. It is difficult to make a statement about the 2014 red wines though it is safe to say that Pinot Noir/Spätburgunder fared much better than the other red varietals, courtesy of the Pinot Noir’s relative hardiness. Earlier ripening varietals, notably Dornfelder, were more severely affected by „suzukii“. For whites it is safe to say the early ripening grapes (Mueller-Thurgau et al) brought very good yields and good quality. The premium grapes which followed later were more affected by the unstable weather and, as the harvest went on, were affected by botrytis, not all of it noble, necessitating meticulous sorting. Where this was done right, the yields shrunk significantly though it was rewarded by excellent ripeness, concentration and very good acidity levels. Overall, the Pinots Blancs and Pinots Gris look very promising. The Rieslings are crisp, delicious, with bright, aromatic fruit and harmonious acidity. Expect very fine wines in both dry and fruity style! The larger portion of the 2014 German crop which was picked early, brought good yields and qualifies largely as „Qualitaetswein“ while the much smaller portion, harvested later at lower yields, qualifies for making „Praedikat“ wines up to Auslese. Eiswein has not been made to date. Bottomline, 2014 produced a normal size crop of very good, in parts even excellent quality. The making of 2014 caused extra hard and extra long work, making it a very expensive harvest. GermanWineEstates has a new look! The new design is cleaner and more refreshing thanks to modern technology. The website will continue to offer information on each of the producers which GermanWineEstates represents as well as current news on the German wine industry as a whole. In a list of the top 100 cellar sections for 2014, the 2012 J. J. Prüm Riesling Auslese Goldkapsel, Wehlener Sonnenuhr, the 2012 Dr. H. Thanisch Müller-Burggraef Riesling Auslese, Bernkasteler Doctor and the 2012 Dr. Loosen Riesling Auslese, Erdener Treppchen, all from the Mosel, were included. Tasting notes for the Dr. Loosen Riesling mentioned the wine’s brisk lemon acidity and ageability. After a hectic year with turbulent weather conditions, finally I am delighted to report from Hochheim again about a “happy end” of the 2014 Riesling vintage: good quality, but smaller quantity. But thanks to a reasonable filled stock from vintage 2013 and before, I will be able to meet the grow.ng demand from my customers around the globe. Probably as result of global warming, the whole vegetation from the beginning in spring through blossoming and ripening until harvesting in October was two weeks earlier than normal. After extremely high temperature in May/June, we had in July/August endless rain showers until the beginning of October, when we finally enjoyed a short period of wonderful sunshine. During the heat wave in early summer, the grapes ripened very early, but during the rain period the berries blew up and the thin skins burst with the risks of infections by botrytis and insects. We had to start with picking already before the end of September, the earliest date in my memory as an active wine grower almost 70 years back! To avoid serious loss in quality and quantity, all vineyards have been pre-picked by hand to remove all damaged grapes and to harvest only healthy, fully ripe grapes. It was a real “turbo – harvest”. The result is much better than expected: The fresh pressed juice from Riesling tasted and smelled clean with typical fruity aromas, the sugar degree reached over 80° up to 100° Öchsle, mostly suitable for Spätlese and even Auslese. The acidity appears crisp and round, well balanced against the typical Riesling fruits and minerals. We are lucky to have harvested from our best certified vineyards Hochheimer KIRCHENSTÜCK and DOMDECHANEY also some “VDP.GROSSES GEWÄCHS®”, the absolute top of the quality pyramid in the dry style. Because of the dramatic reduction of the quantity by rigid pruning, dividing clusters and pre-picking of all damaged grapes, we reach an outstanding intensity and depth of fruit aroma and minerals – real great Riesling in global scale. - The apple doesn't fall far from the tree. Many of Germany's current winemakers have taken over the winery from their parents. We're happy to see them staying in the family business! Despite this year's weather conditions, German wine growers are satisfied with the quality achieved for the 2013 vintage. However, harvest is nearing its end, and the total quantity of harvested grapes is expected to be slightly below expectations. According to the latest estimates from the Deutsches Weininstitut (DWI), only 8.4 million hectolitres of wine must will presumably be harvested this year throughout Germany. Yields will thus be down seven percent compared to the prior year and nine percent compared to the ten-year average of 9.26 million hectolitres. The harvest results differ significantly in the individual vineyard areas, depending on the grape variety and climatic conditions. For example, in the regions of Rheinhessen, Franken and Sachsen, average yields are expected to be equivalent to the previous year. Harvests in the Ahr and Saale-Unstrut regions increased by 30 and 48 percent, respectively, once again resulting in average yields after poor results in 2012. In the other regions, however, forecasts are significantly lower compared to 2012 results. 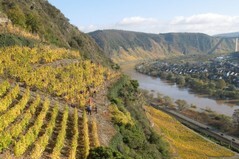 The Mosel’s yields are 25 percent lower compared with the long-term average. Because of this, some wine-growing regions have already announced price adjustments. DWI managing director Monika Reule explained that due to unfavorable weather conditions during the blossoming period in June, Pinot varietials have already not produced the desired quantity of fruit settings. In addition, quality-improving reduction measures conducted have led to lower yields. "This year’s comparatively late period of harvest influenced aroma development quite positively. Even young wines already have a very pleasant fruity note, and their moderate alcoholic strength fits perfectly with the current market demands," says Reule. All grapes in the wine kingdom have their own unique personalities. Riesling’s is fruitiness, in the form of apples, lemons, limes, tangerines, pineapples and so on. Another personality trait is its brisk crunchy acidity. Fruitiness and acidity work in harmony with one another, allowing for Riesling’s mesmerizing personality. Riesling is indeed unique, with the most delicate and ethereally transparent personality in the wine world. I don’t like Riesling, you say, it’s too sweet. As mentioned above, Riesling is about fruitiness, not necessarily sweetness. There is a difference and they should not be confused. Any wine can be dry or sweet, it all depends on the fermentation process. In winemaking, fermentation is the activity where yeast converts the grape’s natural sugar into alcohol. If a winemaker allows fermentation to continue until all the sugar in the grape is used up, the end result is a dry wine. If, however, he wishes to have a little sweetness in the wine, the winemaker will cut the fermentation process short where a hint of the natural sugar remains. When Riesling is fermented to a totally dry state, there’s still loads of fruit flavor because that’s the grape’s natural makeup. It may appear sweet, but it’s dry. German wine is unique, just like Riesling. The whites are the lightest, most delicate wines on earth. They get their complexity, not by power, alcohol or richness, rather by their grace, elegance and transparent character due to a long growing season and the soils in which the grapes grow. Part of their beauty comes from the uncanny balance between the sweetness of the wine and its acid structure. It’s like yin and yang or sweet and sour; one opposite force balances the other. Sweetness and acidity work the same way. Without proper acidity, the sweetness in the wine would appear out of balance and tastes too much like fruit juice. Conversely, without enough sweetness in the wine, its acid structure would feel like layers of tissue are being ripped out of your mouth. Sounds attractive doesn’t it? Just think what this wine tastes like. So in the world of Riesling and Germany, sweetness is an all-important element in the balance and makeup of a great wine. Few, if any, wine regions in the world can captivate the palate as well those from Germany with their uniquely sleek, intense and utterly graceful charm. After a pretty difficult year with up and downs, finally I am delighted to report from Hochheim about the wonderful Riesling vintage 2013, matching perfectly the expectations from the global market: Good, very promising in quality, but small in quantity. Since my inventory from the last vintages had been melted down, now I will do my best to supply the growing demand for fine Riesling for the domestic market and for the global export. In the year 2013 started the vegetation after a long cold period two weeks later than normal in April. But thanks to warm days in May, at Hochheim the vines blossomed in early June, just before the next cold period. In summer, we had some weeks of extremely hot temperatures, but later again whet and cool. The harvesting started one week later than usual in the middle of October and the last grapes were collected at the beginning of November. Thanks to very careful cultivation of the vineyards, the grapes were in healthy conditions until the end of October, which allowed a patient, slow and selective picking. Our strategy to take the risk and to wait for higher maturation with increasing ripening aroma and decreasing, fruity acidity was successful. To achieve clean grape juices, we have pre-picked all vineyards by hand and selected all clusters, which had been infected by sunburn or sometimes by botrytis. The results were golden-green berries with a wonderful fruity aroma, typical for mature Riesling. The sugar degree of the majority reached around 85° and 95° Öchsle and surpassed the legal Spätlese level or reached even the official Auslese requirements. The acidity tastes ripe and round with brilliant fruitiness. We focused specific care for the harvest of a small quantity of clean, aromatic and mineral Riesling “VDP – GROSSES GEWÄCHS” in dry style from the best classified “VDP Grosse Lagen” Hochheimer Kirchenstück and Domdechaney, which will be launched not before September 2014. As result of systematic reduction of the quantity by pruning short branches, cutting away the third grape, dividing the clusters and pre-picking all damaged grapes, I am expecting again a great Riesling GROSSES GEWÄCHS of intense concentration and minerality, the top of the quality pyramid on the dry side. The absolute high-light is a small cask of Hochheimer Domdechaney Beerenauslese at 145° Öchsle with overwhelming rich fruitiness and brilliant acidity. Finally, my family and I, we are most grateful that nature donated such a balanced, brilliant vintage with the wonderful, delicate acidity, typically for noble Riesling and stimulating the enjoyment. I am proud to announce that GermanWineEstates is currently ranked #1 on the Bing website on the subject of German wine. This ranking indicates that GWE has more visibility than any other German wine-related website on the internet. 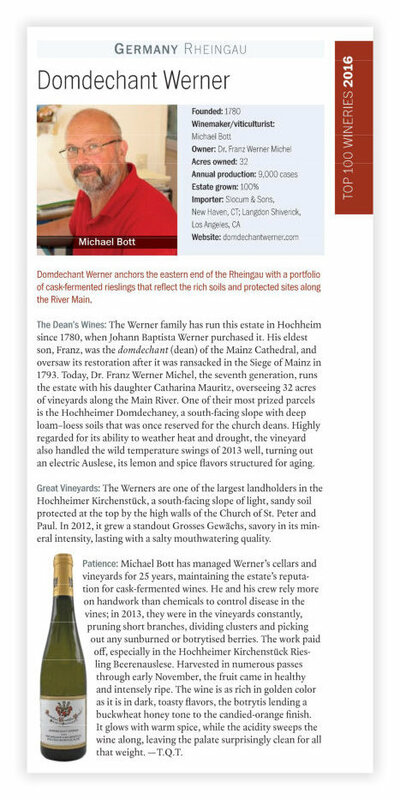 This means that GermanWineEstates is truly “the site for German wine lovers”.